TravelEurope Saint Petersburg hotel reservation service provides you with a wide variety of lodging and hotel options, from cheap hotels to luxury accommodation in Saint Petersburg. Quick and easy hotel reservations with instant confirmation and great value for money whether you travel for business or tourism. Select travel dates and find all available hotels in Saint Petersburg, check out guests reviews and locate properties on Saint Petersburg city maps, book your favourite accommodation with no pre-payment. All rates are in Euros and inclusive of all taxes. The Petro Palace Hotel is an elegant hotel in the heart of St. Petersburg, in a quiet street within walking distance of Palace Square and Nevsky Prospekt. Hotel strategically located in St. Petersburg near the subway, through which you can easily reach the Nevsky Prospect in the city centre and close to the airport. Elegy Hotel is ideally situated in downtown St. Petersburg, nearby all attractions but away from city stress. 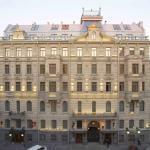 The Avtograf Hotel, is situated at short walking distance from Nevsky Prospekt, the central railway and metro station, well connected to Palace Square and the Hermitage museum.